What's the Best Time of Day to Run or Exercise? Exercise is an important part of a healthy and active lifestyle. While some people prefer running right away in the morning, others enjoy a late afternoon workout. Some people even exercise right before going to be at night. Is there any benefit to exercising at any certain time of day? This is a topic of much debate among athletes, exercise experts, and researchers. While there is some evidence that late afternoon is the optimal time for a workout, there are benefits to other times as well. No matter what, the absolute best time to exercise is the time that works best for you. For quite some time, experts have noted that late afternoon and early evening are the best times to exercise. According to research, you will get optimal results when your body temperature is at its highest. For most people, that is between 4 p.m. and 5 p.m., though some studies extend this time to 7 p.m. It is within these few hours that strength and endurance peak. Exercisers tend to perform better on physical performance tests measuring aerobic capacity and reaction time as well. It's also good timing for injury prevention. You may be more alert and focused in the afternoon and your muscles are warmed up from the day's activities. In the morning, just before you wake up, your body temperature is at the lowest point of the day. This would indicate that the morning is not the best time to exercise. However, there some advantages to a morning routine. 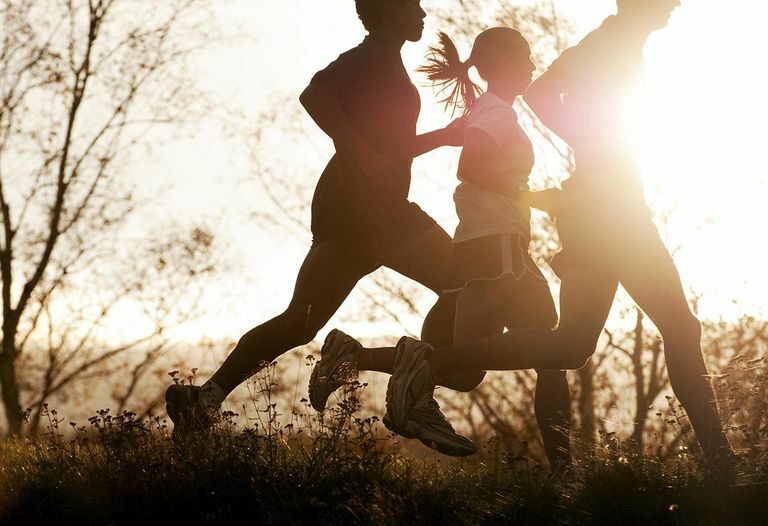 Running in the morning may help keep you motivated. Research shows that morning exercisers are more consistent with their workout regimens than those who work out in the afternoon or evening. This may be due to the fact that you're getting up earlier for the sole purpose of running or hitting the gym. All sorts of hurdles can come up throughout the day that may prevent you from sticking to an afternoon routine. You may have to work late, run the kids to practice, stop by the store, or whatever. In the morning, you wake up and are ready to go with no hurdles in your way. Additionally, early morning is also the coolest part of the day during warmer months. You'll be safer and more comfortable if you run in the morning when it's hot. According to "The Psychology of Exercise: Integrating Theory and Practice," the most practical approach is to adapt your routine to fit your lifestyle. Allowing your exercise to naturally follow your schedule and personal tendencies can relieve the stress of needing to exercise, which will help you stick to it. Some people are natural morning people and a run helps them get ready for the day. Others might find an afternoon workout to be a great break in the day or that exercise helps them unwind after work and blow off steam. Likewise, your schedule may be better suited to a morning run than an evening workout. Between family commitments and work, it's also possible that you may only have a narrow window to squeeze in a workout at night. While you may not feel like working out during that time, it is possible to change your circadian rhythm to fit your schedule. Night owls can also find comfort in the fact that studies have shown that exercise before bed may not affect the quality of your sleep. It may increase your heart rate during the first few hours of sleep, but athletes in one study showed no difference in sleep between their exercise and non-exercise days. This is contradictory to previous research that said morning exercise was better for sleep. However, the one thing that everyone can agree on is that you need to get an adequate amount of sleep. Athletes who are sleep deprived show a significant reduction in performance. If you are training for a specific event or a particular sport, your optimal exercise time should coincide with the activity. For instance, if you are training for a marathon, running in the morning can prepare you for the event because most marathons begin in the morning. In contrast, many baseball and basketball games are played in the evening while soccer games may be scheduled for the afternoon. No matter which sport you participate in, training during those times will help your body perform better on game or race day. If that's impossible, some research suggests that morning resistance training can offset this timing difference. Much of the recommended timing for exercise has to do with your circadian rhythm. It is a daily cycle that regulates many physiological functions, including your alertness, blood pressure, body temperature, and metabolism. Everyone has a 24-hour rhythm and it is possible to adjust it or "teach" your body to perform better at certain times. It's much like adjusting to a new time on your alarm clock. The first week or two can be difficult and you may fight waking up at an earlier time. In a month or so, though, your body gets used to the change and many people find that they wake up before the alarm goes off. The same can be done with your exercise routine. Once you determine that a certain time of day works best for your schedule, body, event, and all the other factors, you can begin to train your body to match it. For example, if you start doing long runs in the morning, your body gets used to running at that time. You'll also get accustomed to the routine of waking up, drinking, eating, using the bathroom, and running. After some time, it will become second nature and the routine will help you stay motivated. While the evidence for the best time of day to exercise is all over the place, the bottom line is that some exercise is better than none at all. Workout when it works best for your schedule. No matter what time of day you do it, you'll still get all the benefits of regular exercise. Chtourou H, Souissi N. The Effect of Training at a Specific Time of Day: A Review. Journal of Strength and Conditioning Research. 2012;26(7):1984–2005. doi: 10.1519/JSC.0b013e31825770a7. Hill DW, Cureton KJ, Collins MA. Circadian Specificity In Exercise Training. Ergonomics. 1989;32(1):79-92. doi: 10.1080/00140138908966069. Lox CL, Martin Ginis KA, Petruzzello SJ. The Psychology of Exercise: Integrating Theory and Practice. New York, NY: Routledge; 2017. Myllmaki T, et al. Effects of Vigorous Late-Night Exercise on Sleep Quality and Cardiaca Autonomic Activity. Journal of Sleep Research. 2011;20(1). doi: 10.1111/j.1365-2869.2010.00874.x. What's the Best Time of Day to Do Yoga? What Are the Best Socks for Running?